This version of our billet aluminum top-feed secondary rail for the FD RX7 (13B-REW) integrates a Y-Block at the rear of the rail. This block is ideal for parallel plumbing your primary rail or adapting a sensor. The rail is machined from 6061-T6 and accepts an -8 o-ring fitting at the rear (inlet) and a -6 o-ring fitting at the front and Y-Block (outlet). Stainless mounting screws and aluminum stands are included with each rail. Include the optional o-ring fittings (with Viton o-rings) and the lower injector bung adapters to complete the secondary rail package. This fuel rail is intended for fuel injectors with 48mm body length and 14mm outside diameter o-rings. Select your secondary rail with 2 fuel injector ports for use with the factory 13B-REW lower intake manifold, or 4 injector ports for an aftermarket LIM. Our 2-port secondary is also available with an integrated fuel pulsation damper. The FPD upgrade is an OEM-style option that reduces fuel pressure oscillation and noise, flattening out the fuel tables during tuning and smoothing part-throttle engine behavior. There is also an FPD-Ready option for a secondary rail that is FPD compatible however includes a plug for the FPD port. 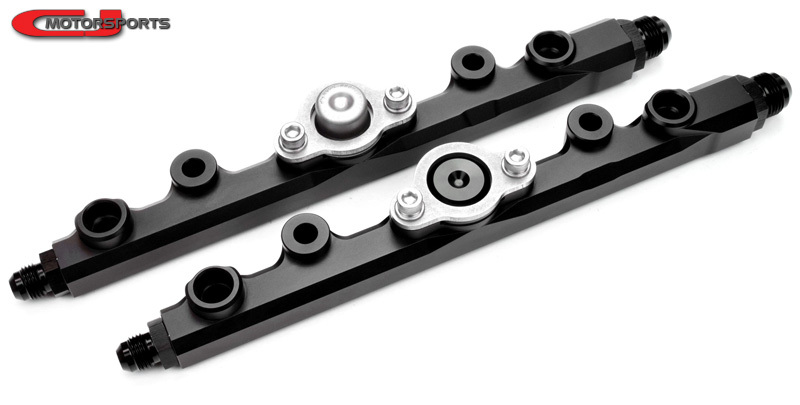 2-Port: A basic rail for 2 secondary injectors, compatible with all known intake manifolds. 2-Port FPD-Ready: This rail has the FPD port, but includes a plug instead of the FPD. 4-Port: For use only with aftermarket intake manifolds with additional secondary injector bungs. Select 2x for use with 2-Port Rails, or select 4x for use with the 4-Port Rail. Include a set of our high quality black aluminum o-ring port adapters for connecting your custom fuel lines. Viton o-rings are supplied with the fittings. Choose between a 6AN inlet and outlet, or an 8AN inlet and 6AN outlets.